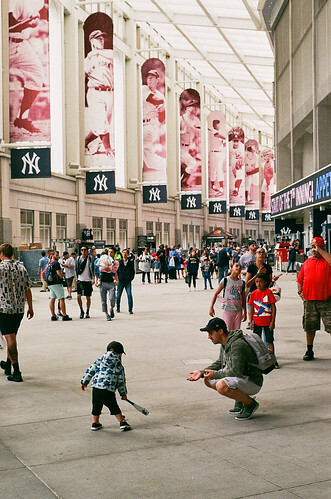 For $15 you can get a Pinstripe Pass at Yankee Stadium that gets you one beer and general admission access - perfect for a nimble photographer with a Nikon FG 35mm camera and a roll of Fujicolor 200 film. "Standing Room Only" - Nikon FG with Series E 50mm f/1.8 "pancake" and Fujicolor 200 film. Program mode. Photo by Derrick Story. 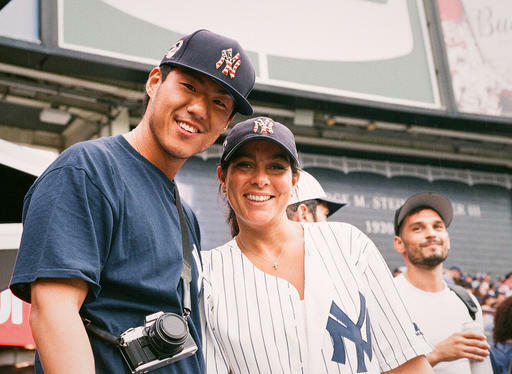 So we took the train to the Bronx with passes in hand and explored the new stadium (well, new to me) as the Yankees took on the Blue Jays. 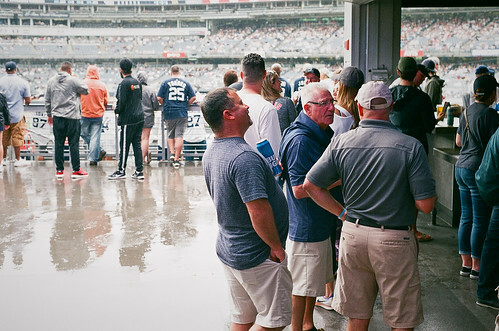 A little rain blew in that afternoon, but it didn't dampen the spirits of the crowd who watched the hometown favorites pound out 10 runs against the visitors from north of the border. "Minolta Fan with Girlfriend" - Nikon FG with Series E 50mm f/1.8 "pancake" and Fujicolor 200 film. Program mode. Photo by Derrick Story. During one of the inning breaks, I noticed another analog photographer with a Minolta hanging around his neck. "Good looking camera," I said to him. He smiled and replied, "Wouldn't mind having your Nikon, though." "I love it," I replied. Then I looked at his girlfriend and said, "See, you thought he was crazy with that old camera. He's just cool." She smiled, and I asked if I could take their picture. "Of course!" They look great. Then it was time to roam. I had my eye on this cotton candy vendor who was working the covered walkway. "Can I take your picture?" I asked. He looked at me, then at my throwback film camera, and replied, "Ah..., why not." "Cotton Candy Vendor" - Nikon FG with Series E 50mm f/1.8 "pancake" and Fujicolor 200 film. Program mode. Photo by Derrick Story. I worked my way back to the outfield. Many fans were gathered around the beer stand. You have to show your ID regardless of age. That's funny to a guy like me who's been around the block quite a few times. So I showed my license and received my complementary Bud Light. while I was waiting, I photographed these guys having a good laugh. "Having a Beer with the Guys" - Nikon FG with Series E 50mm f/1.8 "pancake" and Fujicolor 200 film. Program mode. Photo by Derrick Story. The rain picked up again, so I headed for cover. There was this wonderful vendor area that served food and drinks and was perfect for hanging out. 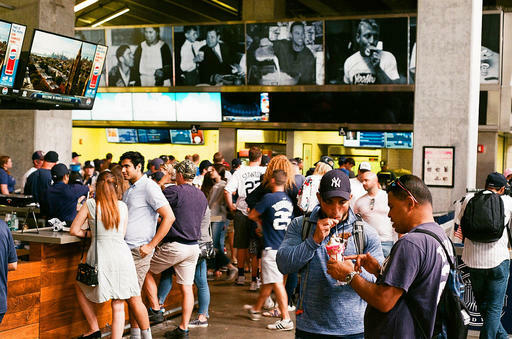 There were TVs everywhere, big pictures of Yankee greats, and bars and tables to lean on. People were definitely having a good time. 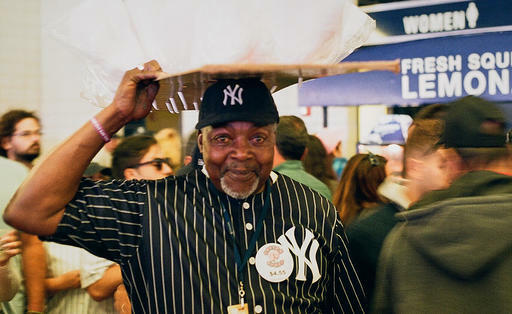 "Hanging Out with Yankee Greats" - Nikon FG with Series E 50mm f/1.8 "pancake" and Fujicolor 200 film. Program mode. Photo by Derrick Story. At this point, the Yankees were leading 10-2. We decided to catch the train back to Midtown for our next adventure. On the way out, my boy grabbed my arm and said, "Let's go this way." He led me this magnificent hall where I spotted a boy playing with his dad. It was the perfect last shot of the afternoon. "A Boy and His Dad" - Nikon FG with Series E 50mm f/1.8 "pancake" and Fujicolor 200 film. Program mode. Photo by Derrick Story. 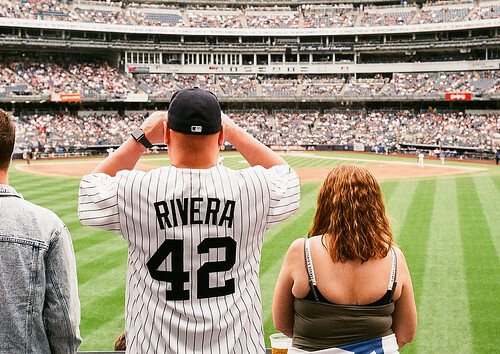 And that was my afternoon at Yankee Stadium: a beer, a win, a roll of film, and my family. Pretty good stuff.